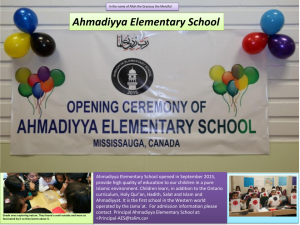 The ​Ahmadiyya Elementary School ​(AES) ​runs under the guidance of Department of Ta`lim Jama`at Ahmadiyya Canada, is the first Ahmadiyya private school to operate in Canada. AES will provide one of the best combinations of Islamic and academic education for Ahmady children in Western world. Ahmadiyya Elementary School will​ be​ operate​d​ by highly qualified professional Ahmadi​ teachers in ​an ​Islamic atmosphere. The school is expected to become leader in the private education sector. This unique school will provide the learning experience to each student that will open the doors of wonderful opportunities that await him/her in future and at the same time will nourish its students spiritually. The administration, staff and students will strive to work together to make it an institution of excellence and commitment. A key feature of the success of academy is that it employs existing professional teaching methodologies of public schools and fans them out to deliver the religious education. In addition to Ontario curriculum students will learn Holy Qur’an, Salat and basic teachings of Islam Ahmadiyyat. The school is expected to play vital role in upbringing of our children in an atmosphere that is satisfying, peaceful, friendly and fulfilling. By being blessed with such an institution, we hope to be a part of building a sound and stable youths by inspiring and motivating our younger generations through true Islamic values and academic subjects and thus preparing them for a bright future and well respected citizens of Canada. Registration for the year 2018 will be opening soon. The new academic year begins in September. Dates of the New Year (Sep 2019 – Jun 2020) will be announced soon. 10610 Jane Street, Maple, ON, L6A3Y1.